How to recover deleted or lost data from external hard drive in Windows? Position : Tips - How to recover deleted or lost data from external hard drive? How to recover deleted or lost data from external hard drive? Trying to recover lost or deleted data from external hard drive? Tutorial in this page will show you how to recover data from external hard drive due to deletion, formatting, file system corruption, partition loss, disk not showing up or other causes by using professional external hard drive data recovery software in Windows 10/8/7/Vista/XP. Guide 1: How to recover deleted data from external hard drive? Guide 2: How to recover data from RAW / inaccessible external hard drive? Here are two questions we often come across on technical forums and communities, and such situations are common and alarming. Losing data from external hard drive brings big trouble and great loss. How many people know how to recover files from external hard drive? How many users would just be panic and not knowing what to do? "I have a 1TB external hard drive which contains large amount of data. Yesterday, it stopped working and I couldn't access it. Every time I tried to open it in my computer Windows Explore, it asks me to format it before I can use it. I‘ve tried in to three computers and got same error message. Do I have to format it? Is there any way that repairs the external hard drive without losing data? I also tried some hard drive recovery software which seems takes hours to scan the drive before lost files can be recovered. Do you know any way which is better and effective?" "My external hard drive is WD 2TB disk, and my son formatted it a couple of days ago. I began noticing the issue when I wanted to backup files this morning. Fortunately, my computer is able to recognize it on the File Explorer. I need to restore photos and videos which are previous files recording my family members. Can anybody help? Is there any professional software that can help me recover lost data? Please suggest!" The convenience of external hard drive is self-evident. It allows users to carry terabytes of files everywhere they want to go, and files can be easily shared on many computers. The installation of external hard disk is simply and handy. 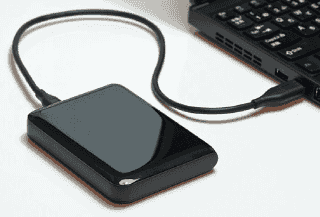 These advantages make external HDD so popular among users all over the globe. What are the major concerns of external HDD users? Many users store files on external hard drive as a backup and expert files to be safe. However, hard drive cannot be that reliable as expected. That's why IT experts always suggest users should keep more than one copy of significate data on different devices. Data you store on external hard disk or other storage devices can get lost due to lots of reasons. A silly mistake such as accidentally pressing Delete key can bring huge trouble. There is not a Recycle Bin for external storage devices to restore accidentally deleted data. Formatting disk or external hard drive corruption also removes data. Such scenarios won't be issues if you know how to recover lost data from external HDD. If you have no idea about the recovery process, then keep reading. The goal of this guide is to show you how to solve external hard disk data loss issue and help you get back lost data safely. Files may get lost in hundreds of ways, and not all lost files can be recovered successfully. Here are a few tips to help you protect lost file against overwrite so that you can recover lost files as many as possible. Whatever be the causes, once you realize data loss issue, you should stop using the drive to avoid further damage and overwriting lost data. Do not format external hard drive even though it prompts to format it every time you connect it to computer. Do not run commands like chkdsk or other system repairing actions, otherwise, file system may get damaged during the process. Do not repair bad sectors. Although your external hard drive is suffering from bad sector issue, you should not try to repair bad sectors if files haven't been backed up. Connect the external disk to computer and make sure it can be recognized by operating system. If the external hard drive is not showing up, you cannot perform data recovery on your own. Download and install professional hard drive data recovery software on your computer instead of the external disk. External hard drive data recovery can be an easy task if you use professional recovery software which is able to help you deal with all kinds of data loss issue efficiently. Eassos PartitionGuru Pro is a proficient data recovery program which can recover lost or deleted files and partitions from hard drive, external hard drive, virtual disk, RAID, SD card, flash drive, etc. and supports recovery of data from file systems such as NTFS, exFAT, FAT32, Ext2, Ext3 and Ext4. It is compatible with all Windows PC systems (all editions, 32/64-bit) as well as Windows Server 2000, 2003, 2008 (R2), 2011, 2012 (R2), 2016. This external hard drive data recovery software supports recovery of more than 550 file formats, including images, documents, multimedia files, emails, archives, etc. In some cases, it is able to display files of RAW drive directly without doing any scanning. Besides, avanced users can recover lost data manually via analyzing hex data on the disk with the help of built-in hex editor. Also, it supports to recover data from crashed Windows system with bootable media. Free download Eassos PartitionGuru Pro on your computer and follow steps below to recover data from external hard drive now! This guide is going to recover deleted files or folders from external hard drive using Eassos PartitionGuru Pro and all deleted data can be recovered correctly as long as no data gets overwritten. This tutorial can also be used to recover deleted files from SD card, USB flash drive, Recycle Bin, hard drive, etc. Before starting recovery, you need to connect the external hard disk to computer. Step 2 Select recovery option and click Start button. To recover deleted files from external hard drive, the "Recover Deleted Files" option should be selected. Eassos PartitionGuru displays lost files while scanning is ongoing, and you can preview files to check if they are correct. Double-click a file and you can open it in preview window which shows file content in its original size. By way of previewing files, you'll be able to locate what you want to recover and judge whether they can be recovered correctly. Step 4 Copy recovered file. Select files and folders you need and right-click on them to select "Copy To" from context menu. After that, you can set a folder on another disk to save these files. Step 1 Connect the external hard drive which has turned to RAW or corrupted to your PC and launch Eassos PartititonGuru. Step 2 Select the corrupt external hard disk in the left pane of the main interface and click Files tab as follows. If you can see files you want to restore, then you can copy them to a healthy hard drive at once and get them recovered. If your files are not shown in this method, and the external hard drive is using NTFS file system before it gets damaged, you can try this: select the inaccessible partition and click "Load Current Partition Intelligently" from Tools menu. 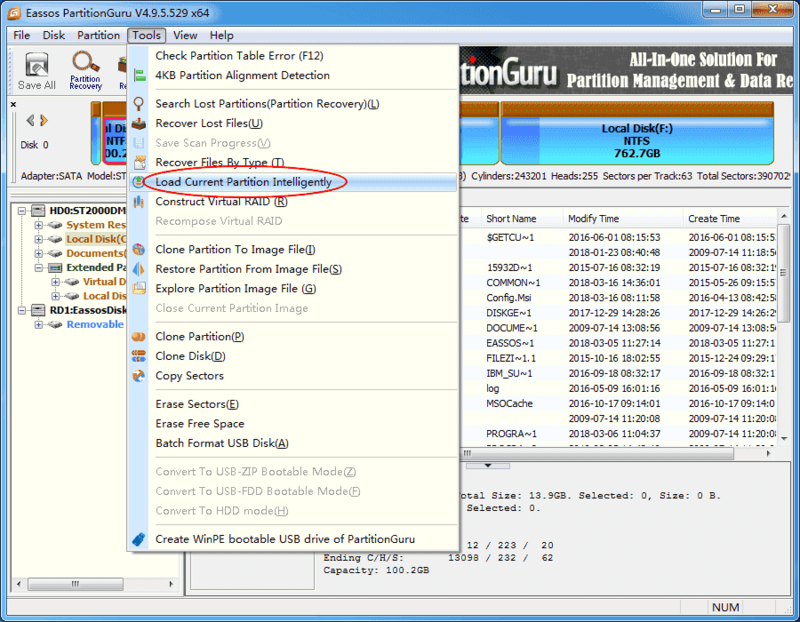 This feature is designed for damaged NTFS partition recovery. When NTFS partition is corrupted, you can try this function to load files and then copy recoverable data to a different disk. If youe disk has been severely damaged, these two methods won't work on your external hard drive. In that case, what you need to do is scanning the disk for lost files, then move to next step. Step 3 Select the corrupt external hard drive and click File Recovery button, which opens the Recover Files window. Follow suggested selections and click Start button to search for recoverable data. Step 4 While PartitionGuru is scanning the disk for lost data, you can preview files have been listed. Once all your files are found out, you can stop scanning. Step 5 Choose files and folders you want to recover and right-click on them to select "Copy To". You'll be prompted to select a folder to save restored files. There are a number of factors that are responsible for data loss issue on external hard disk, some known, some unknown. Below is a list of common causes that we should know. Accidental file deletion or formatting of disk. The #1 reason of external disk data loss is such kind of human errors. Users are likely to unintentionally delete important files or format disk by mistake. Fortunately, file deletion or formatting does not permanently erase data and we can get them back using recovery software. Partition / repartition external hard disk. If you partition a hard drive which already contains partitions, you'll lose current volume after partitioning. Enclosure or power supply issue. An external hard drive is composed of an enclosure, power supply and an internal hard drive. If there is something wrong with the enclosure or power supply, files may get loss. File system corruption or damage. File system corruption of partition on external hard disk lead to issues like partition cannot be opened. You may receive error message like "The file or directory is corrupted and unreadable"; or the partition turns to RAW drive which prompts "The type of file system is RAW, chkdsk is not available for RAW drive" when you run chkdsk command. Unexpected system shutdown or power failure. Operating system issue brings various problems one of which is data loss. Virus threat. Data stored on external disk can be attacked by virus or malware which may encrypt, delete or damage data. Bad sectors. Same as internal hard drive, external hard drive also gets bad sectors with which disk may freeze, slows down or even cannot be recognized by Windows. This instruction talks about external hard drive data recovery, including data loss causes, solutions and how to protect data. The recovery process is much easier than many users have imaged. If you encounter data loss issue, you should stay calm and follow this guide to recover lost data. To prevent data from loss, you should back up data on a regular basis and maintain at least 2 copies of backup on different drive. If you find this guide useful, please share it with your friends; if you have any questions, please feel free to contact our support team.